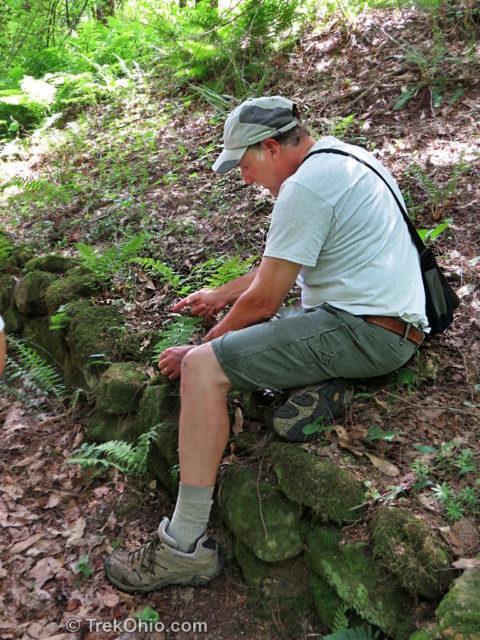 For some time I had been wanting to learn more about ferns, so I took advantage of a workshop on fern identification being held at the Wahkeena Nature Preserve in Fairfield County, Ohio. Wahkeena is a great place to learn about ferns since 29 species of fern grow there (Wahkeena’s official blog publishes a list of their local fern species). Naturalist Tom Shisler led the workshop which is called Focus on Ferns. 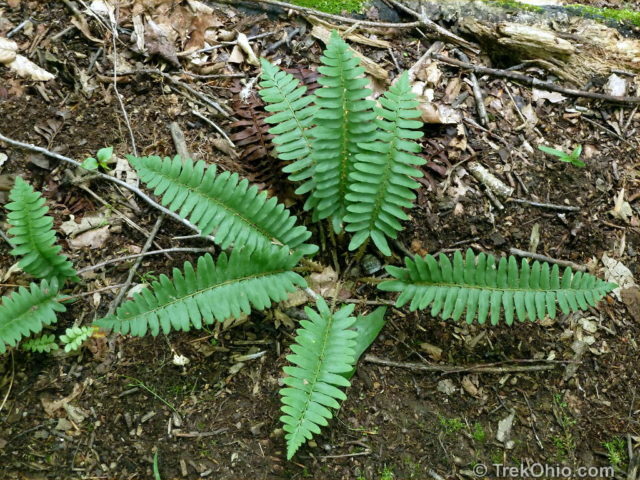 In this post I’m going to introduce you to a number of common ferns found in Ohio by summarizing Tom’s presentation. Cinnamon fern (Osmundastrum cinnamomeum); it’s always a pleasure to encounter a large ground cover of ferns like these while hiking. The above photo was taken in while hiking in the Oak Openings Metro Park in the Toledo area. 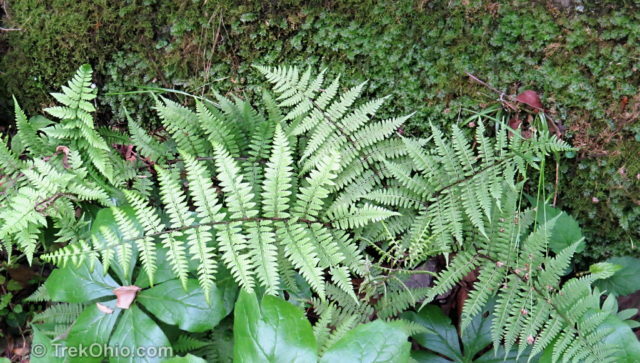 Prior to taking the workshop at Wahkeena I had photographed a number of beautiful ferns thinking that I would be able to identify them later via the photo. However after taking the workshop I came to the conclusion that I’m not going to be able to identify many of these because I didn’t gather enough data in my photographs. 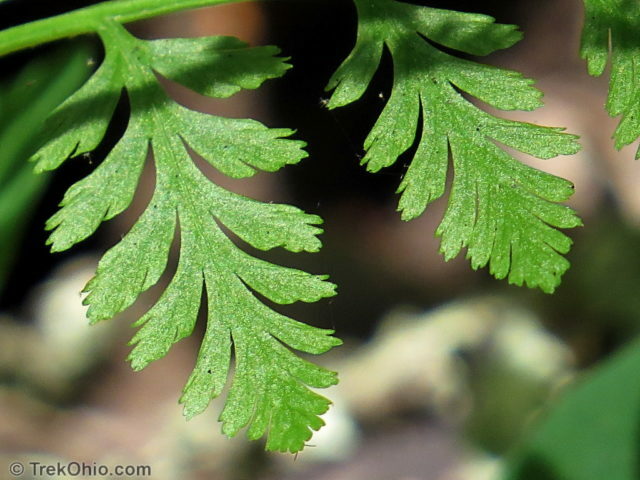 When attempting to identify a fern, its important to look closely at one of the fronds, to turn it over and look at its underside for reproductive structures, and also to examine the frond’s stalk making note of its color and texture. I’m going to make observations about a species key characteristics as I describe the ferns below, but to make the descriptions easier to follow, I’ll start by introducing a few technical terms. 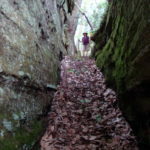 Tom Shisler introduced us to some basic terms while we explored the trails, frequently stopping to point out the distinguishing characteristics of different fern species. The frond of a fern consists of a stalk with a green, leaf-like growth emerging from it. Usually the leaf-like material of a frond is sub-divided into multiple leaf-like growths. When the blade is divided in this way, each division is called a pinna (pronounced “PIN-nuh”; the plural is pinnae, pronounced “PIN-knee”). Some pinnae are further divided into pinnules. In some cases the pinnules are further divided into lobes. The more that the leaf-like material is divided, the more feathery or lacy the frond looks. Fronds that are divided again and again are said to be finely-cut. This is the underside of a frond showing the big pinna (plural, pinnae), the smaller pinnule, and the reproductive structure known as the sorus (plural, sori). 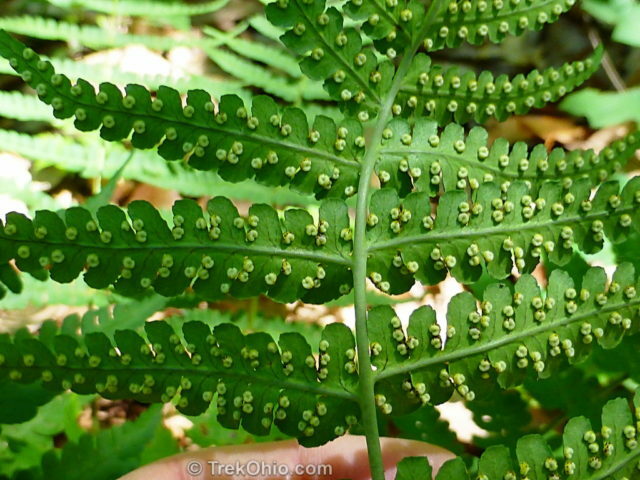 Unlike flowering plants, ferns reproduce via spores instead of seeds. An individual spore is so tiny that it is invisible to the naked eye. However the spores are housed in visible structures while they are developing. These structures are known as sori (pronounced “SORE-eye”; the singular is sorus, pronounced “SORE-us”). The sori grow on the underside of a frond. 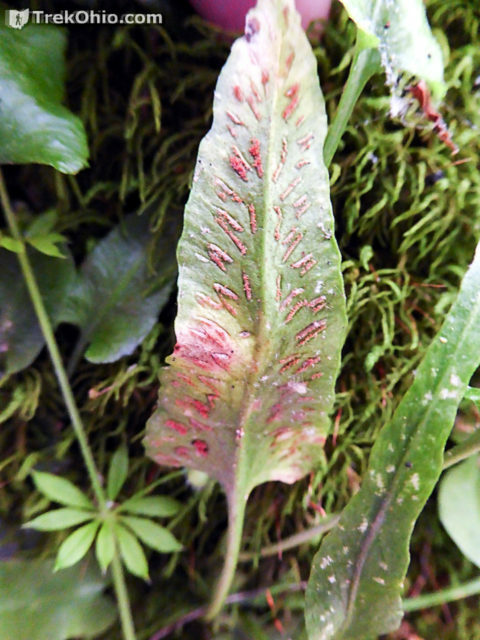 Observing the location and appearance of these sori is a big help in identifying the fern’s species. In some species each individual sorus is easily seen (check out the photo above), but in other species the presence of sori just seems to change the color, texture and shape of the frond. 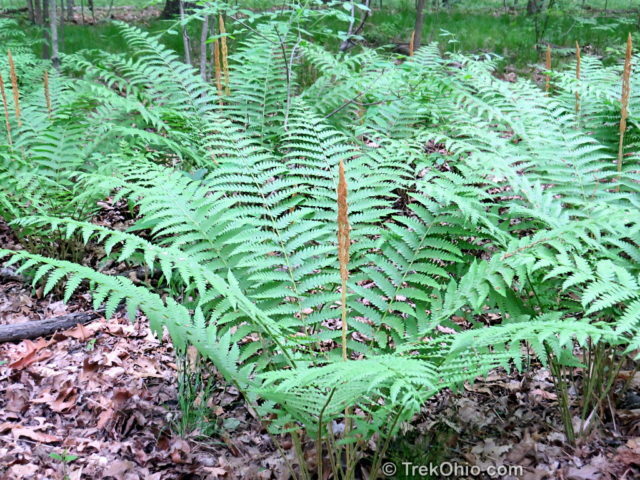 Some ferns species produce mostly sterile fronds (without sori), while also producing one or more fertile fronds (with sori). Other ferns consist entirely of fertile fronds. And in some fern species, the sori only emerge from some of the pinnae, while they are absent from the rest of the pinnae. 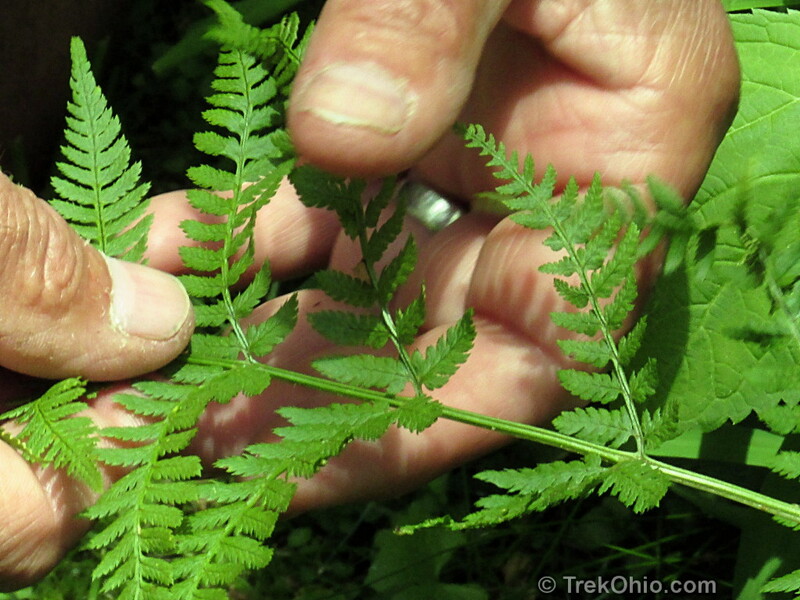 Examining the stalk of a frond can also be a help in identifying the fern species. The part of the stalk from the ground to the beginning of the frond’s leafy area is known as the stipe. The portion of the stalk to which the leafy material is attached is known as the rachis. Noting the stalk’s color and its texture (for instance, whether the stalk is hairy), can be helpful in identifying the fern species. 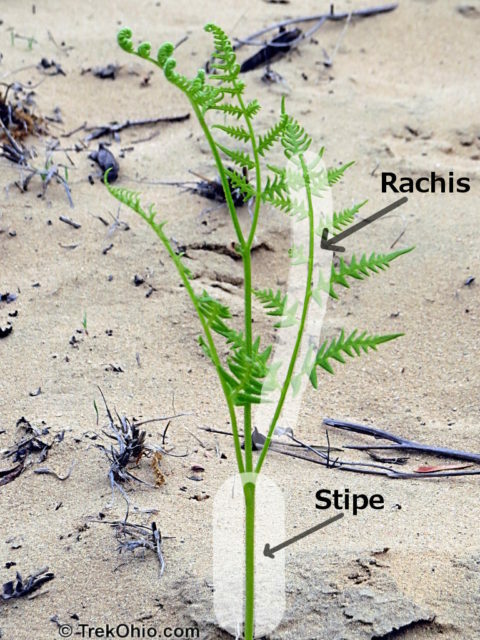 The stipe is the part of the stalk (stem) leading up from the ground to the blade (the leafy part of the fern); the rachis is the part of the stalk within the blade (leafy area). There are many species of fern that have the word spleenwort in their name. These ferns do not have spherical sori like those shown in the previous photo. 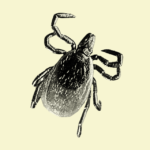 Instead each sorus is similar to the shape of a spleen. For all practical purposes, you could also say that each sorus is shaped like a kernel of rice, or like a hot dog bun. 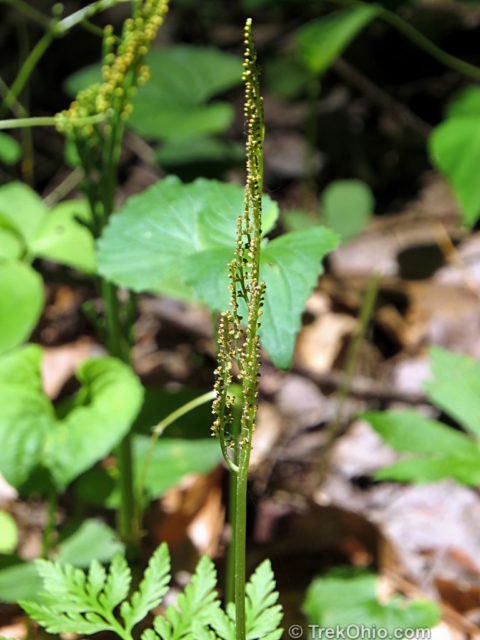 As to the name, wort, this is just an old-fashioned word for “plant.” So whenever you encounter spleenwort in the name of any of the species discussed below, be on the lookout for elongated, oval-shaped sori. This fern has spleen-shaped sori, so it is some type of spleenwort. 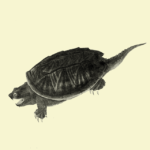 In the headers below, the common name links to an article at Wikipedia about that species. 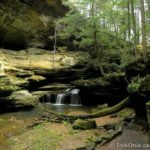 A list of all the species also appears at the end of this article with information about that species distribution in Ohio. 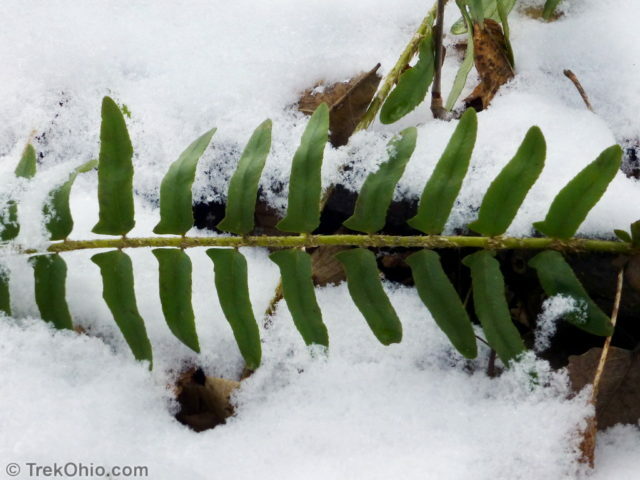 Christmas fern is common in Ohio. Looking closely at the frond, you’ll see that there is a “bump” on the top of each pinna near the stalk. A mnemonic for remembering that this is Christmas fern is to imagine that each pinna is a sled, and that the bump is Santa sitting in the sled. Pinna of Christmas Fern (Polystichum acrostichoides); imagine that the bump on the top of the pinna is Santa sitting in his sled. Here’s a look at the whole fern. 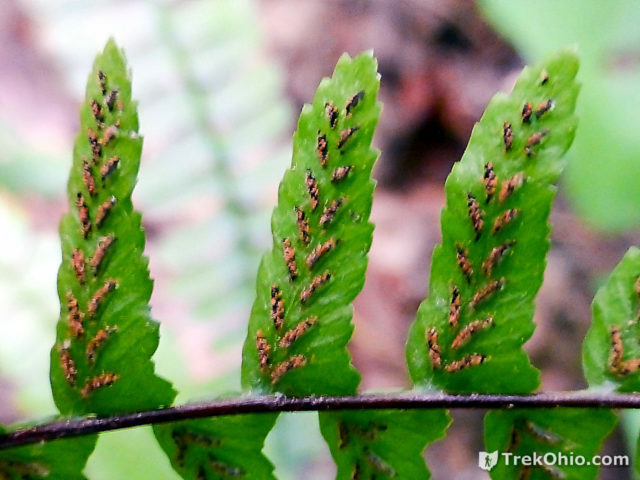 The spores only develop on the top portion of the frond. The fertile pinnae curl up as the spores on them develop. The sori underneath the pinnae are not seen distinctly, but they make the entire underside turn brown. Christmas Fern (Polystichum acrostichoides), showing fertile pinnae at top and sterile ones at bottom. Instead of seeing distinct dots (sori) on the bottom of the fertile pinnae, the back of fertile pinnae looks completely brown. Here’s a close-up of the brown fertile pennae at the top of the frond. Christmas names got their common name because people in the 1800s used to use their evergreen fronds to decorate their homes for Christmas. As you can see from the surrounding snow, Christmas ferns are evergreen. 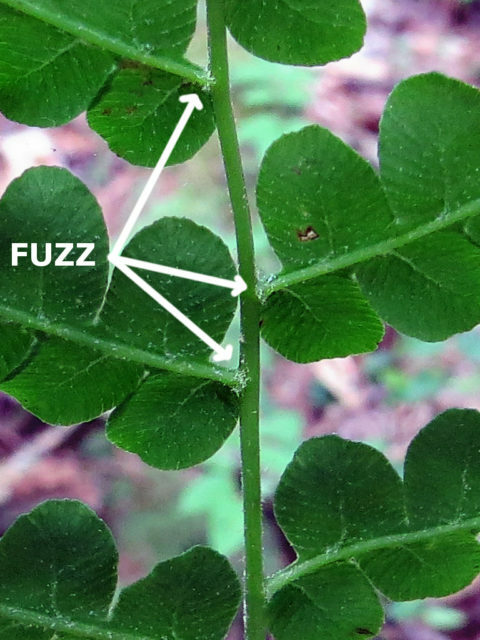 To identify a Maidenhair fern, take a good look at the stalk. The stipe (the leafless, bottom portion of the stalk) is long and black. At the top of the stipe, the stalk divides into two rachises (the part of the stalk with leafy material). The two rachises are mirror images of one another. Each rachis bends in a semi-circle with the distant end of the rachis drawing near the end of the other rachis. The overall effect is as though you are looking down on a raised, horizontal circle of fronds. At first glance the fern below looks a bit like the one above. However the spleenwort below does not have a long stipe (the stem going from the roots to the leafy bit). 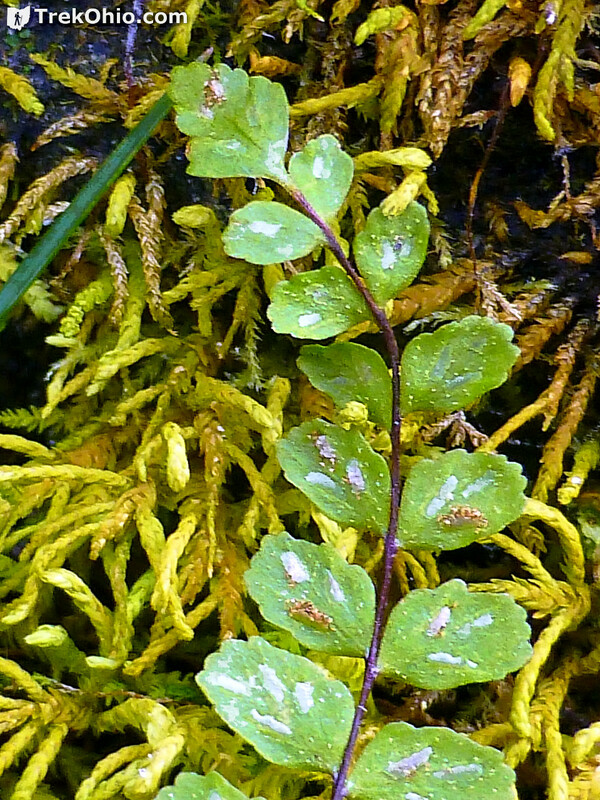 The pinules (green leaflets) seem longer in the Maidenhair Wood Fern above and shorter in the Maidenhair spleenwort below. Also note that the spleenwort is growing right out of a rock. It turns out that Maidenhair Spleenwort prefer rocky habitats, especially when the rocks are limestone. I did turn the frond over to see if there were any sori, and this is what it looked like. Like all spleenworts, the Maidenhair spleen wort has elongated sori. After the spores have been released, their leftover housing (the sori) look white like the ones above. 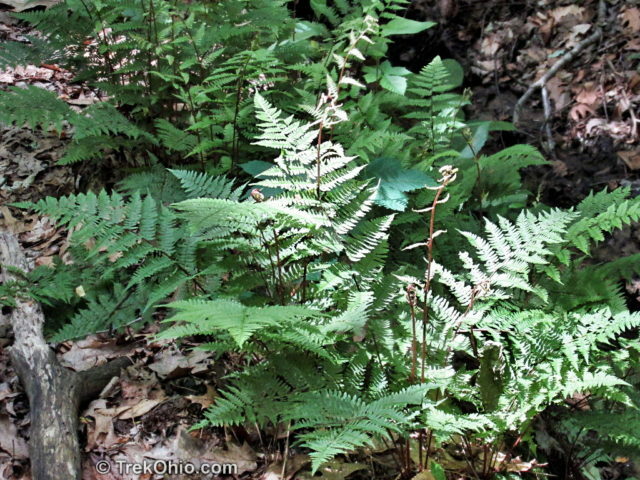 Lady Fern is recognized by its reddish or wine-colored stalk. In addition its pinnea tend to be widely spaced on its rachis (top portion of the stalk). 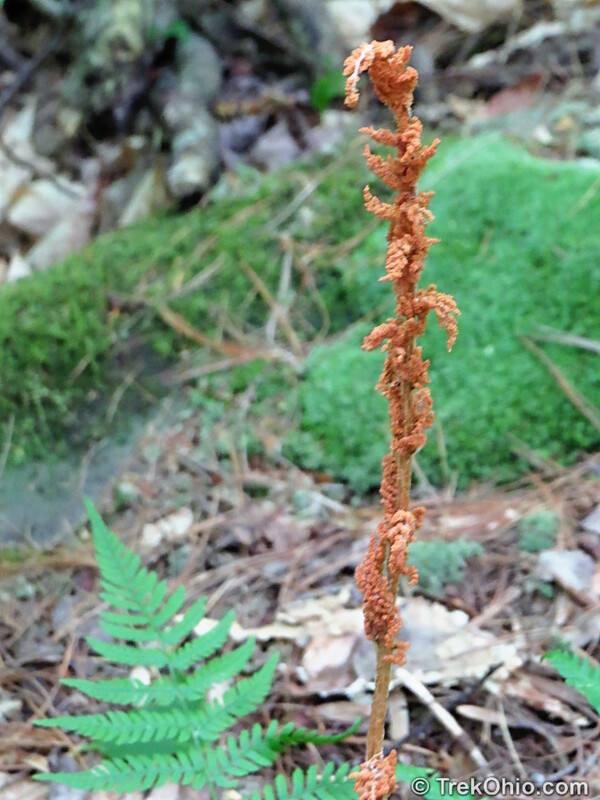 Lady Fern (Athyrium filix-femina); note the reddish stalk. 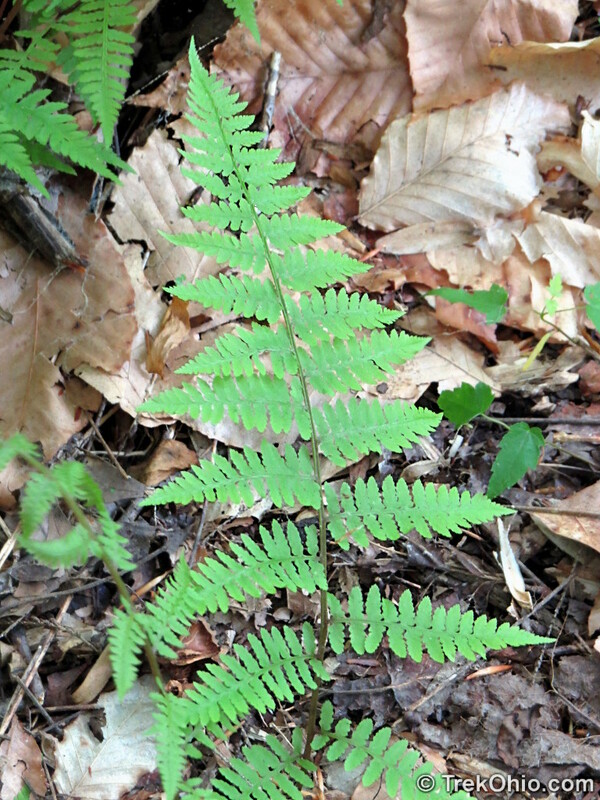 Lady Fern (Athyrium filix-femina); in this frond the stalk is more reddish toward the bottom. This closer view also helps to illustrate how widely spaced the pinnae are, particularly toward the bottom. 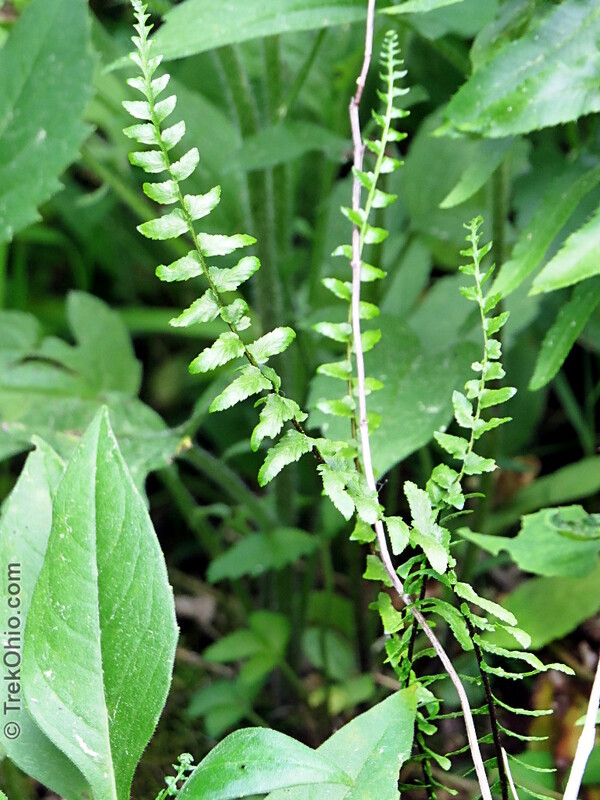 These two fern species are closely related and resemble each another. The easiest way to distinguish between them is to note the difference in the location of the reproductive sori. In the Cinnamon Fern all the sori are located on a dedicated fertile frond that looks very different from the remaining fronds. The fertile frond shoots up vertically from the center of the fern, and it is the color of cinnamon which gives this species its common name. 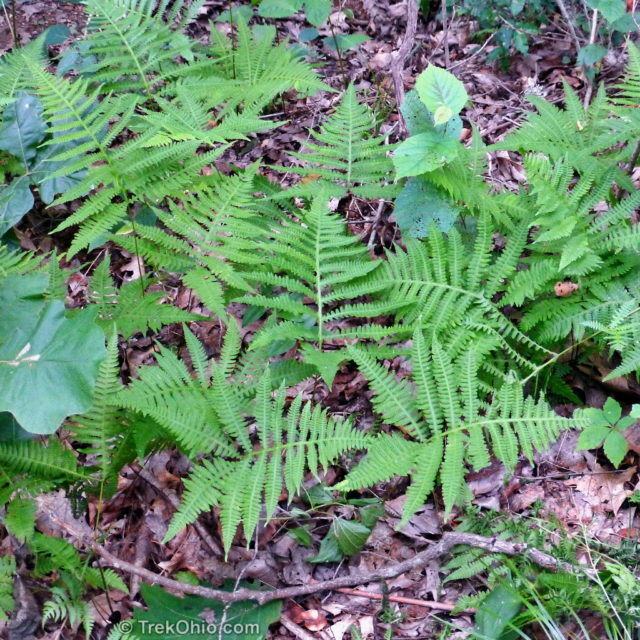 The top-most photo in this post is that of a forest floor covered in Cinnamon ferns. Below is a closer look of one of the plants. 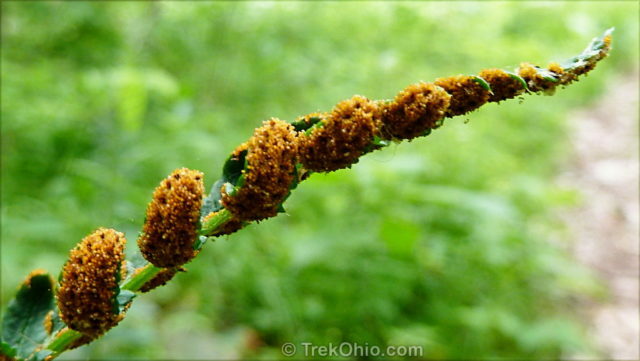 And here’s a closer look at the fertile frond of a Cinnamon fern. The pinnae of the Cinnamon fern and the Interrupted fern are similar in shape and in their arrangement. 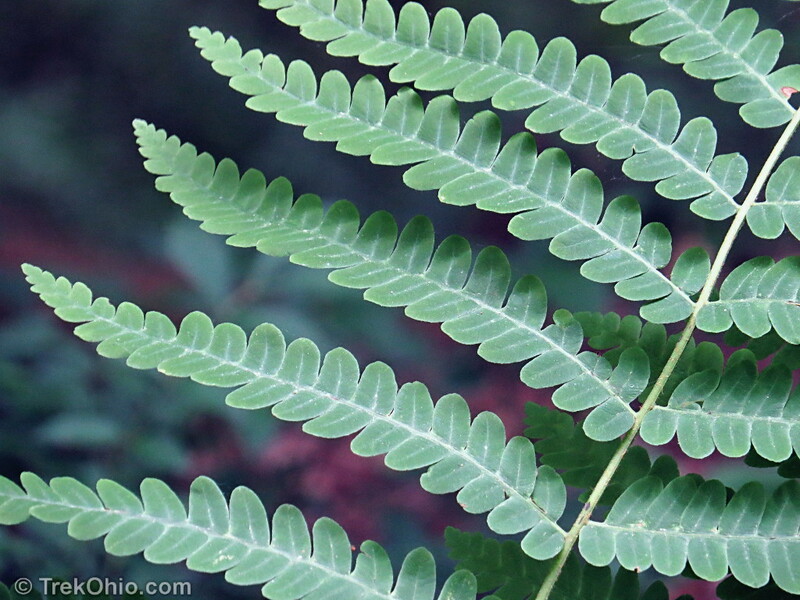 Below is a closer look at the underside of a Cinnamon fern frond. 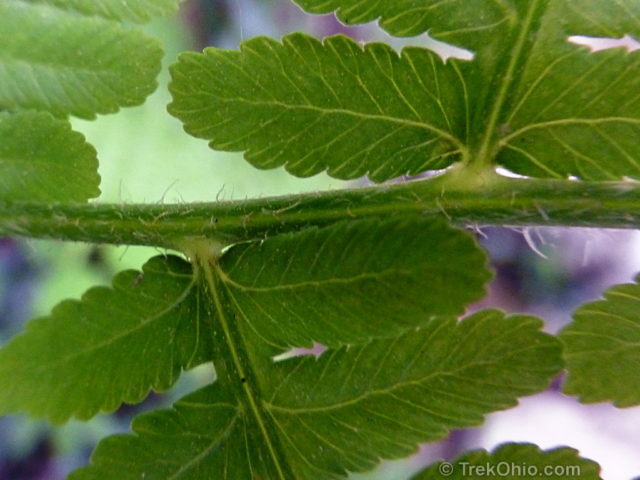 Note that there are no sori on the underside of the pinnae since the sori are all located on the fern’s cinnamon-colored fertile frond. So the above frond is a sterile frond. However, there is a further way of distinguishing between the sterile frond of a cinnamon fern and that of an Interrupted Fern. 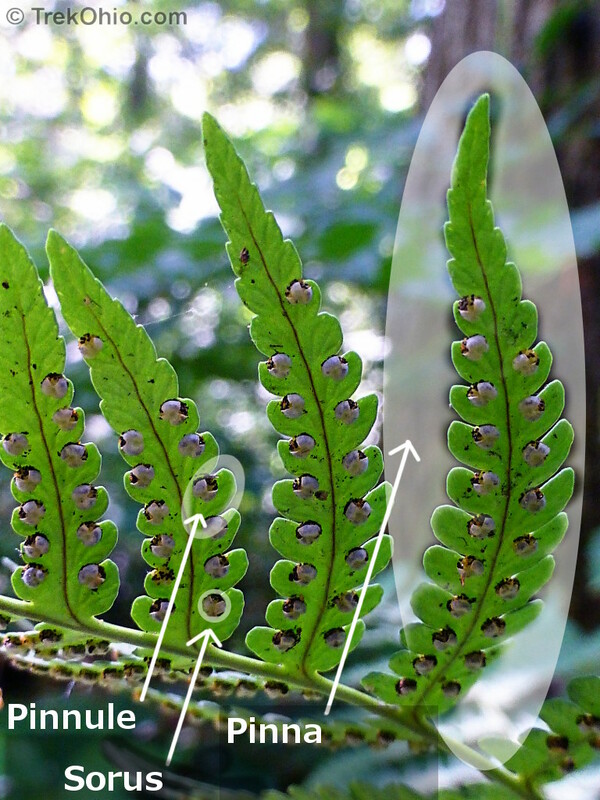 If you look closely at the point where the pinna attaches to the rachis (stem) of the fern, you will see that there is a little bit of white fuzz that is present in the cinnamon fern, but which is absent in the interrupted fern. A little bit of white fuzz can be observed at the point where the pinna is attached to the rachis (stem) of the cinnamon fern. Below is the very similar-looking sterile pinnae of an Interrupted fern, but this time viewed from the top. 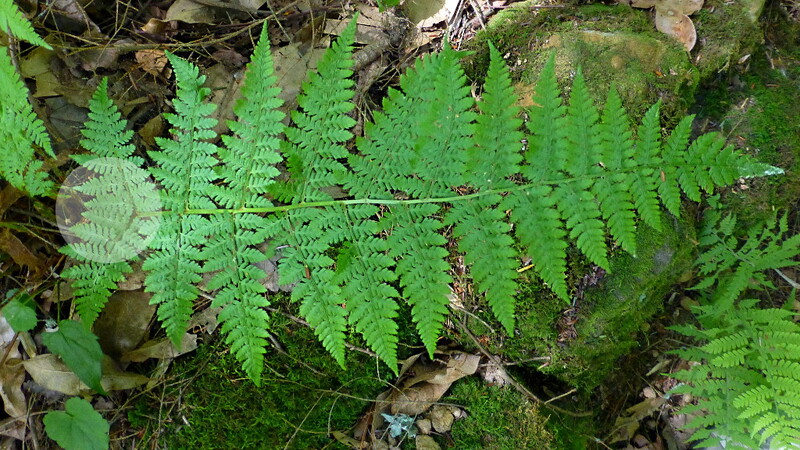 The most characteristic feature of the Interrupted fern is the location of the sori on the frond. Unlike the Cinnamon fern, the sori are not located on a distinct fertile frond. Like the Christmas fern the Interrupted fern has fertile pinnae (with sori) and sterile pinnae (without sori) on the same frond. In the Christmas fern all the fertile pinnae are located at the top of the frond and all the sterile pinnae are at the bottom. In contrast an Interrupted fern has sterile pinnae both at the top and bottom. But in the middle the frond the sterile pinnae are interrupted by a few brown, droopy-looking fertile pinnae as shown below. The brown, fertile pinnae of the Interrupted fern (Osmunda claytoniana); somewhat out of focus below the brown, fertile pinnae are green, sterile pinnae. Similarly there are green, sterile pinnae above these brown, fertile pinnae. Interrupted Fern; the frond is just unfurling. The dark green pinnae are fertile. As the sori mature, these pinnae will turn brown. 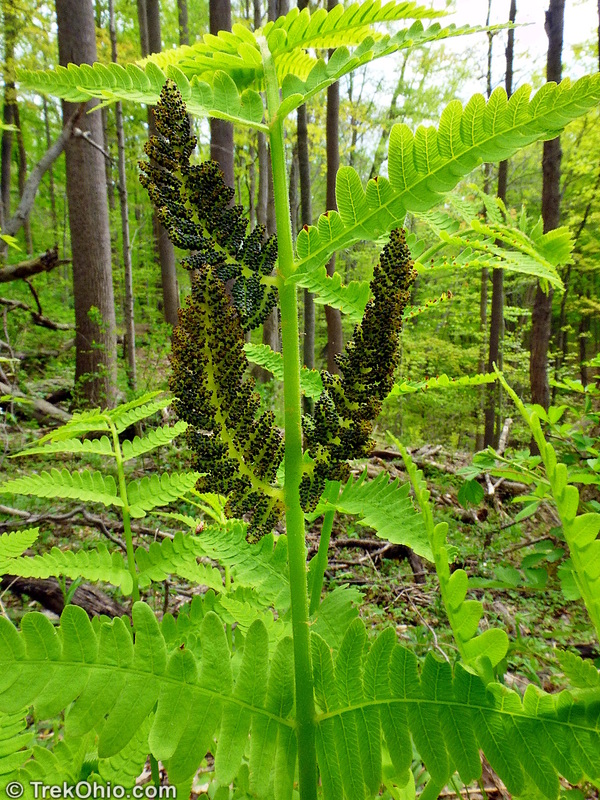 Interrupted Fern; the brown pinnae are fertile. Eventually these pinnae will droop. Silvery spleenwort is also known as Silvery glade fern because it grows in openings or glades. The foliage, though green, is a bit yellowish. The sorai are arranged on the back of the pinnae in a herringbone pattern. It is said to be “silvery” because the length of the stem is covered in white hairs. Silvery spleenwort viewed from underneath. It has little white hairs emerging from the rachis (stem). 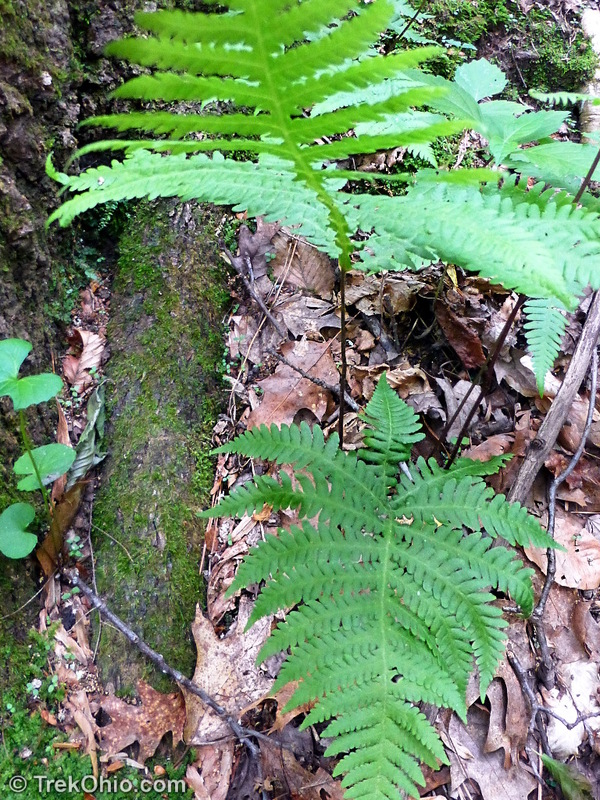 This is a small fern with long, narrow fronds. Frequently you’ll encounter a plant with three fronds. The stem is “ebony” or black. The sori are spleen-shaped just like the Silvery spleenwort that we saw earlier. Ebony spleenwort (Asplenium platyneuron) – Tom indicated that this species was often found with three fronds. If you look at the rachis (stem) near the bottom, you’ll see that it is black which is how it gets the common name, Ebony. 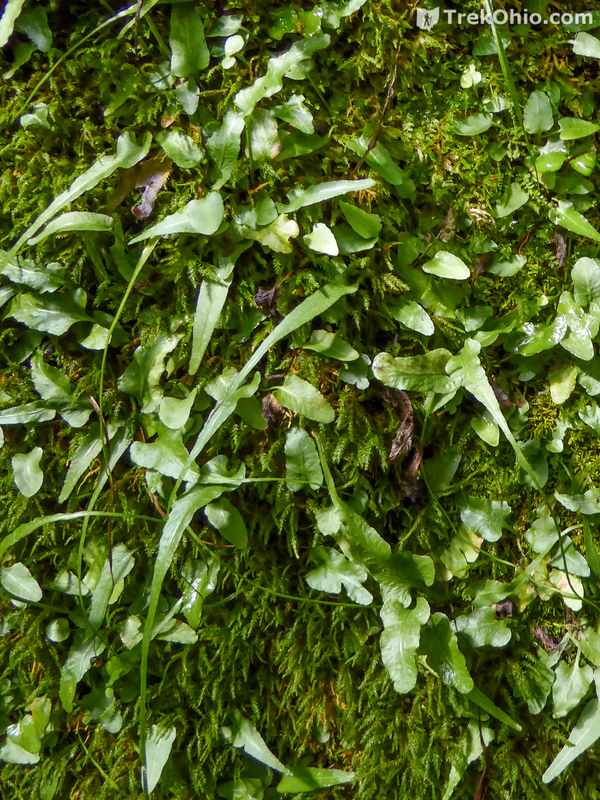 A patch of ebony spleenwort ferns (Asplenium platyneuron) in the center of the photo. This view of the underside of the frond shows the spleen-shaped sori and the black rachis (stem) of the ebony spleenwort. 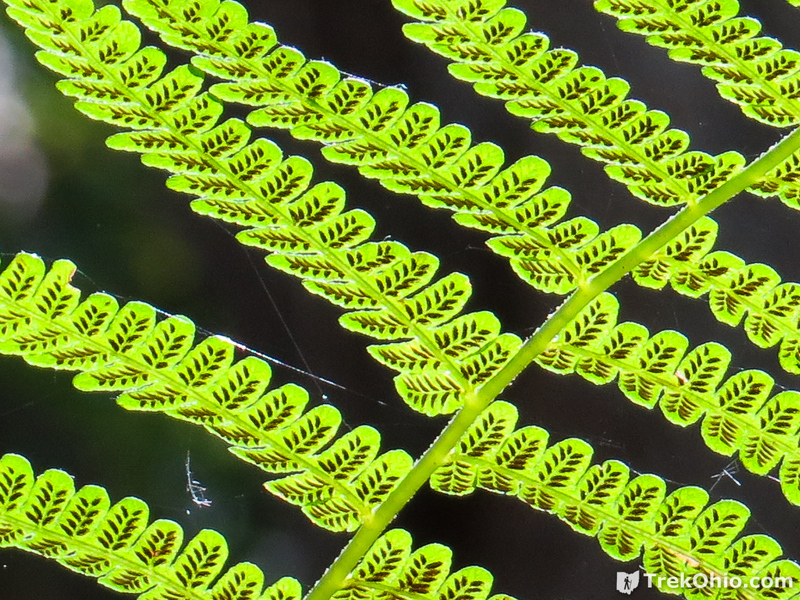 At the fern’s base, the sterile fronds are triangular in shape and nearly horizontal. 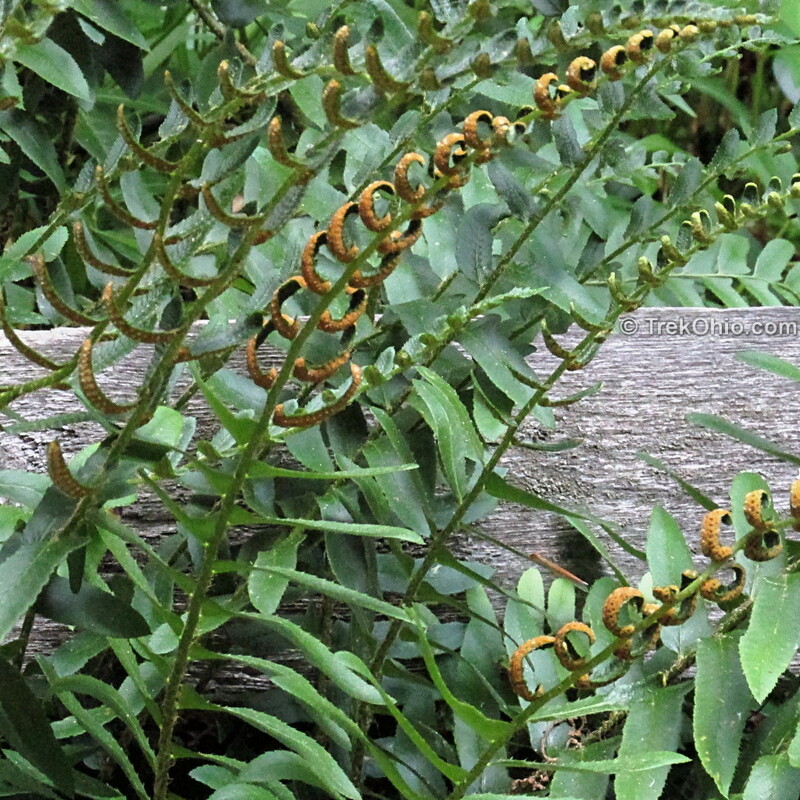 All the sori are located on an erect, fertile frond shooting up from the fern’s center. When the fertile frond is mature, you can tap it and see it emit a cloud of spores. 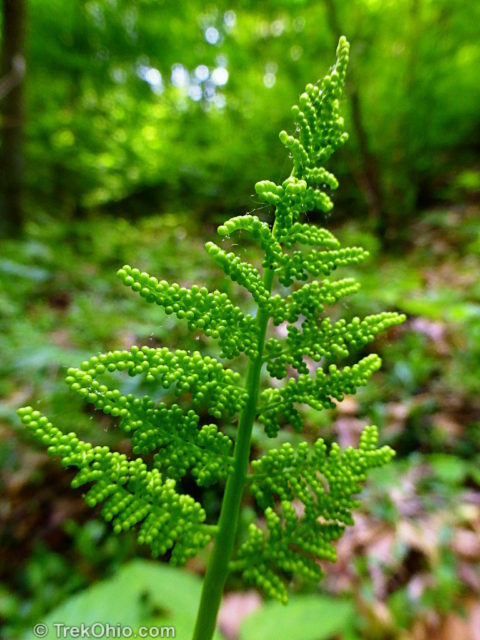 Fertile and sterile fronds of the Virginia Grape Fern (Botrychium virginianum); also known as the Rattlesnake Fern. Before the fertile frond is mature, it is green and the pinnae have a beaded, grape-like appearance. Or you might look at the rounded, tightly grouped fertile pinnae and be reminded of the end of a rattlesnake’s tale. 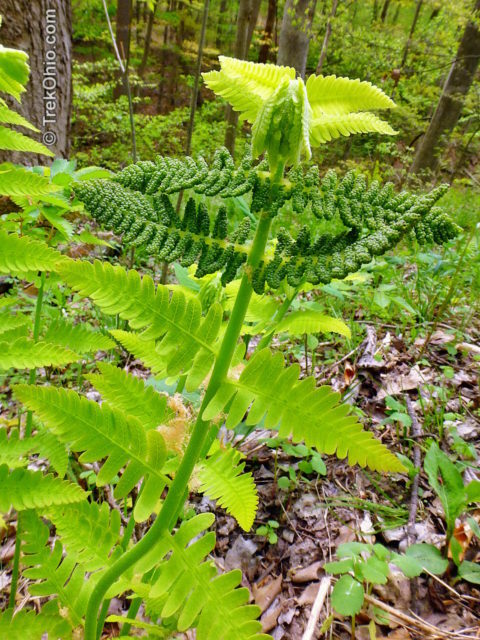 So its the fertile frond that gives rise to its two common names, Grape fern and Rattlesnake fern. 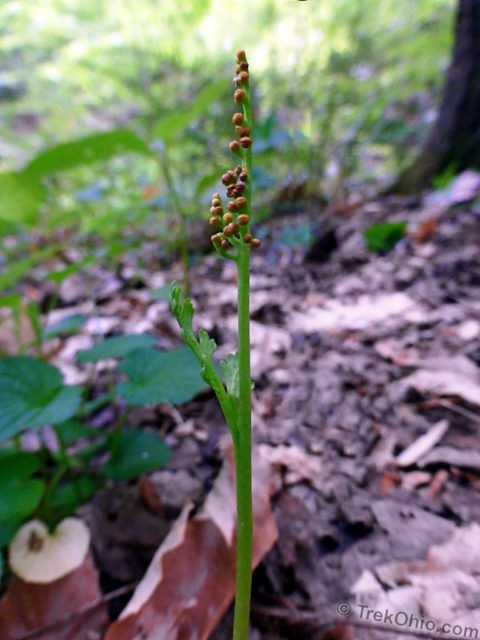 (Botrychium virginianum); also known as the Rattlesnake Fern. The immature fertile frond is green. 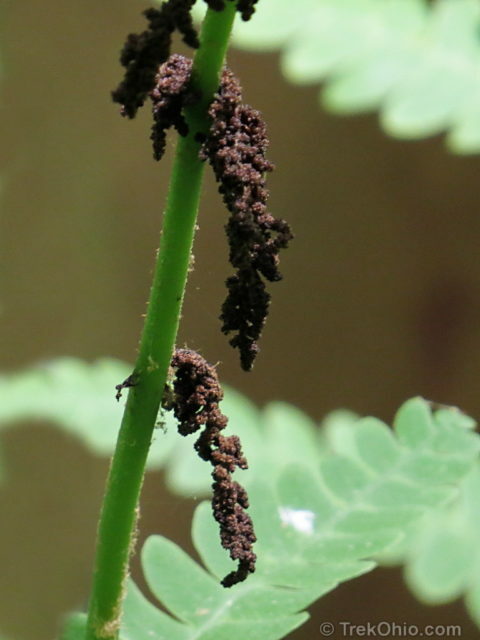 (Botrychium virginianum); also known as the Rattlesnake Fern. The sterile pinnae of the Virginia Grape Fern are finely cut and have a lacy appearance. From the same stalk the plant produces a fertile frond and a small sterile frond whose shape resembles a daisy leaf. The one pictured below was around 6 inches tall. Daisy-leaved Grape Fern (Botrychium matricarifolium); the fertile frond looks like it has brown beads on it. 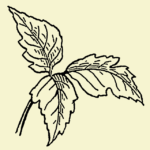 In plant terminology the word, margin, refers to the edge of a leaf or frond. 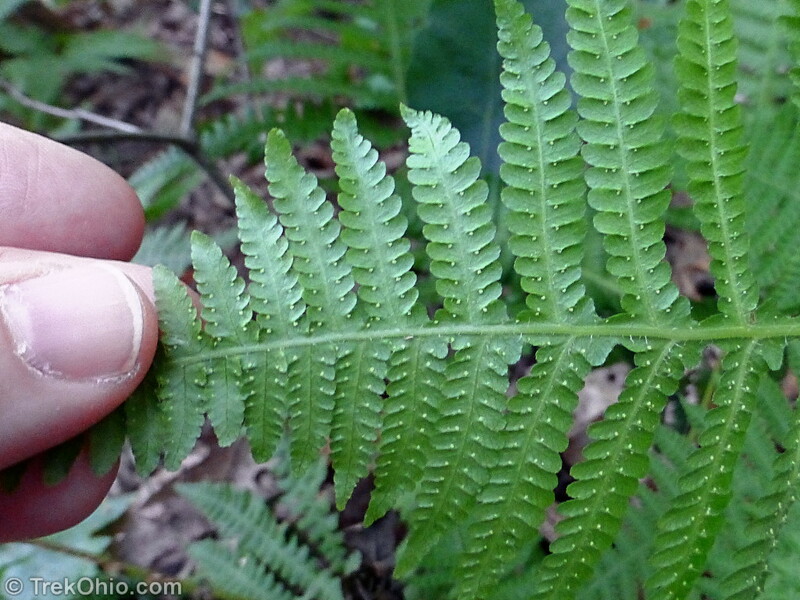 In the case of the Marginal wood fern, the margin of each pinnule is relatively smooth as seen below. Marginal Wood Fern (Dryopteris marginalis); view of a frond from the top. 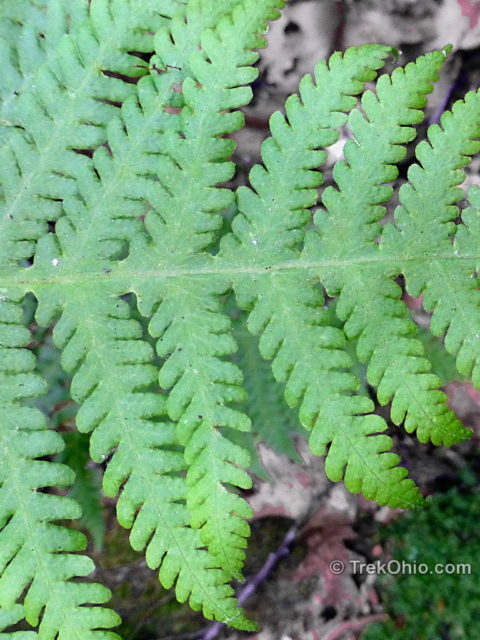 Sori viewed on the underside of a frond of the Marginal Wood Fern (Dryopteris marginalis). Note that the light-colored sori are near the edge (margin) of each pinule. In contrast the the margins of the Spinulose Wood Fern are finely-cut (or thrice-divided) which gives the Spinulose Wood Fern a more lacy appearance. Spinulose Wood Fern (Dryopteris carthusiana) viewed from underneath, showing sori. 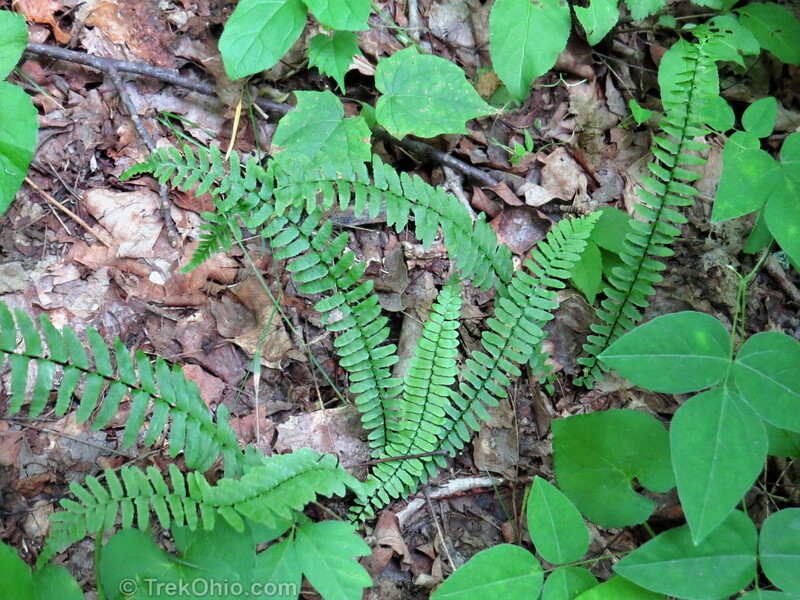 The Intermediate Wood fern looks very much like the Spinulose Wood fern. To distinguish them you have to look at the bottom of the frond, which is circled below. The bottom pinnae of the Intermediate Wood Fern next to the stem are shorter than the adjacent pinnae. The remaining pinnae taper to the end. 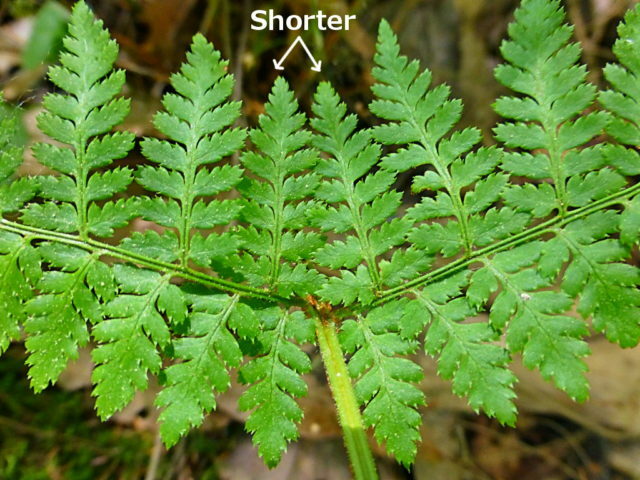 On the bottom-most frond near the stipe (stem), the pinna nearest the stipe are shorter, then the next one over is larger and from here to the end it gradually tapers. The Sensitive fern and the Broad Beech fern are similar in that the both have a winged rachis (stem-like structure to which the pinnae are attached); the wing is a leafy edging found along the sides of this stem. The photo below illustrates what I mean. 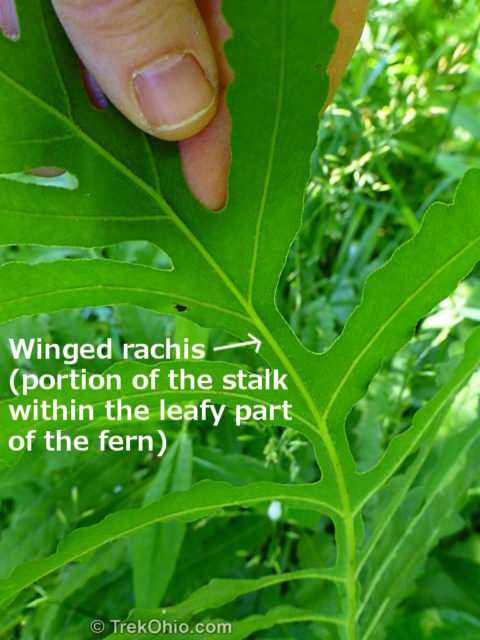 A winged rachis (stem) is one in which leafy material runs along the length of the rachis. The fern in the above photo is a Sensitive fern. Below is a photo of the entire frond. 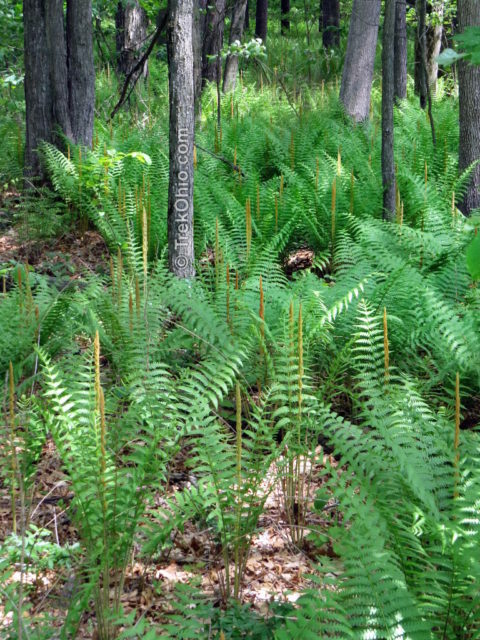 And the photo below shows a patch of Sensitive ferns. Intermixed with the green, sterile fronds are brown, fertile fronds. 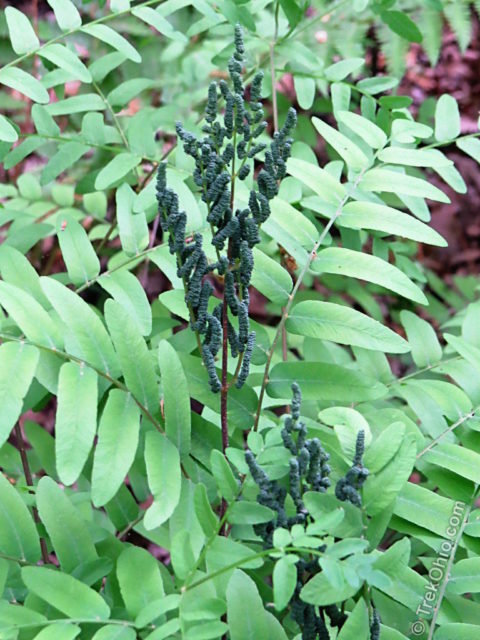 Sensitive fern (Onoclea sensibilis) — you can see some dark, fertile fronds mixed in with this group. 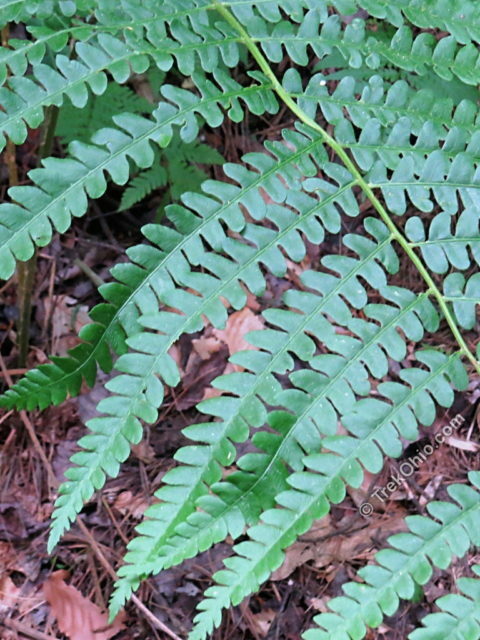 Below is a closeup look at the top of a Broad beech fern. 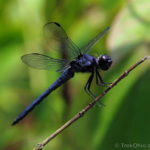 You can see that it also has a winged rachis. 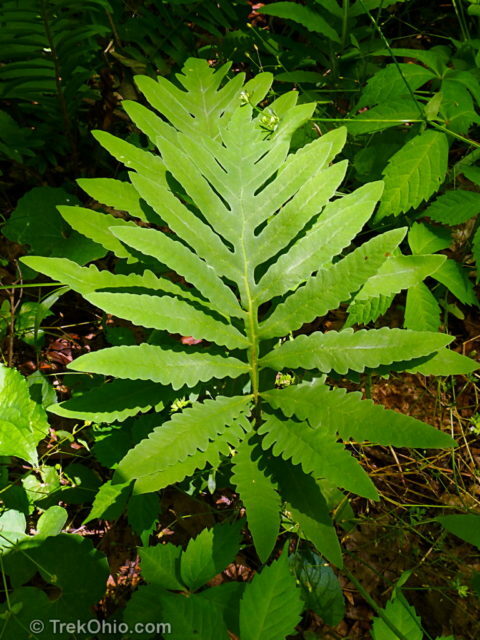 However the pinnae are grouped much closer together than those of the Sensitive fern. 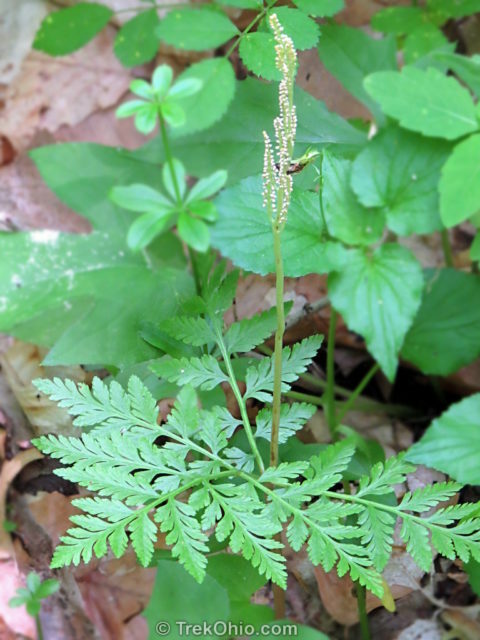 In addition, the margin or edge of the pinna of a Sensitive fern has more a of wavy look, while the pinna of a Broad beech fern has almost rectangular looking pinnules. Below you can see what the entire Broad beech fern looks like. Lifting up one of the fronds, you can see that this species of fern has a brown stipe (the stem from ground to leaf). 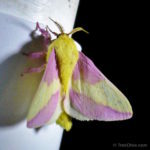 This is another of its distinguishing characteristics. 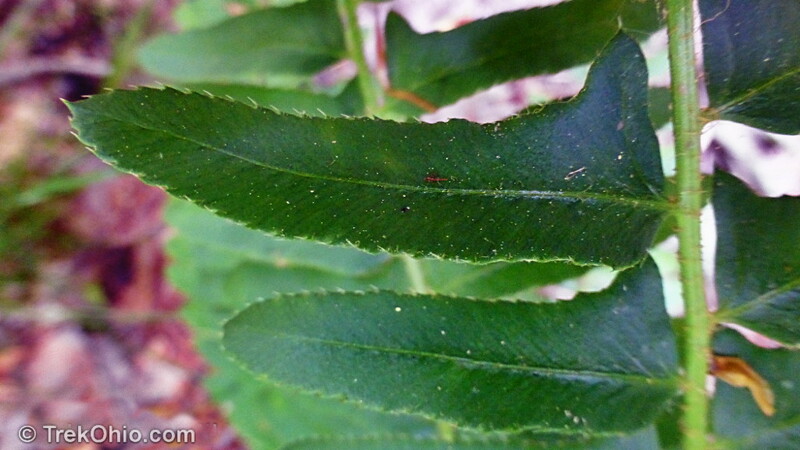 Broad beech fern (Phegopteris hexagonoptera) – I’ve lifted up the frond to reveal brown stipe. The underside of a broad beech fern (Phegopteris hexagonoptera). The light color bumps are the sori which contain the sperms. 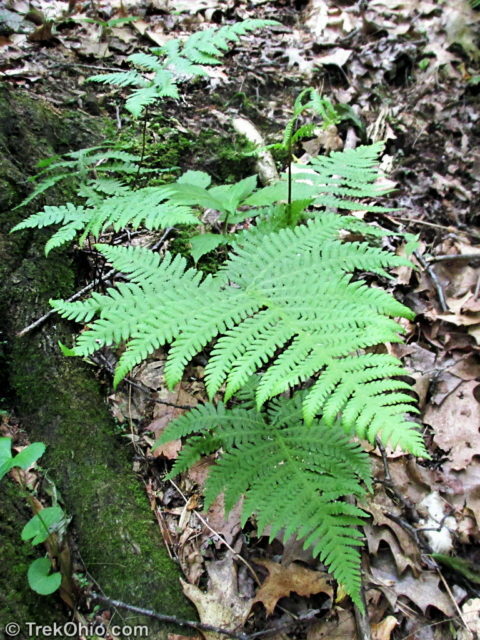 This fern is often seen growing on top of outcroppings. 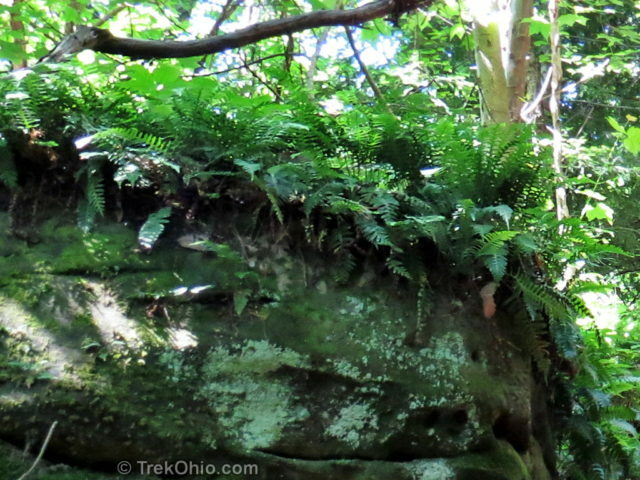 Rockcap fern gets its common name because that’s where it grows — capping rocks. Looking up at it from below, you can see the circular, brown sori on the fern near the middle of the photo below. I didn’t see a Royal fern during this visit to Wahkeena, but it is listed as one of the species that grows there. Each pinna is attached to the the stem at a single point. The margins (edges) of the pinnae are smooth. Royal fern (Osmunda regalis) – note the dark, bluish-green fertile fronds in the center. When more mature, the fertile frond will be brown. Besides reproducing via spores, walking ferns can reproduce asexually by cloning itself. When it is in the process of doing this, it grows an extra-long blade. A new plant sprouts from the tip of the blade as you can see below. 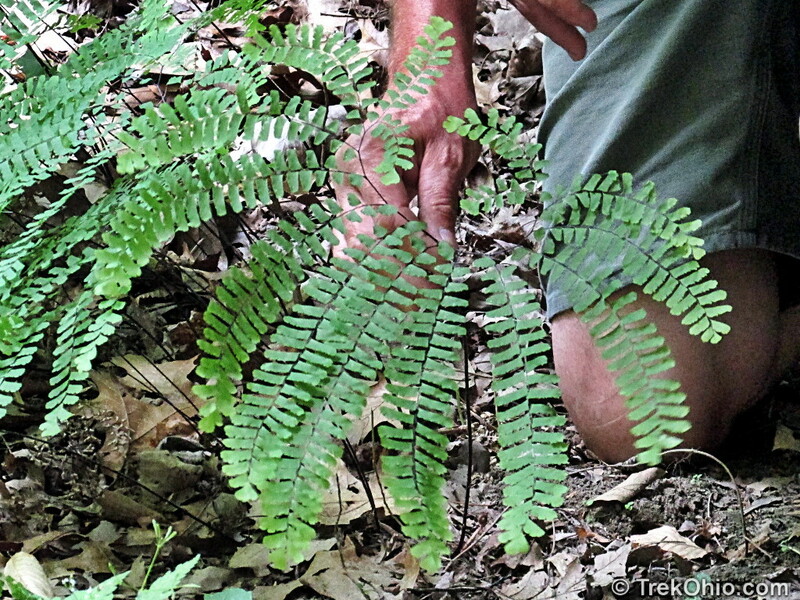 This is how a walking fern “walks.” The tip of the extra-long frond sprouts a new frond and roots. 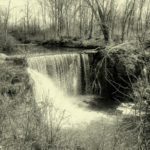 It is very common for the plant to spread all over its rocky habitat as seen below. Although the same plant is quite good at cloning itself, it also reproduces sexually via spores. 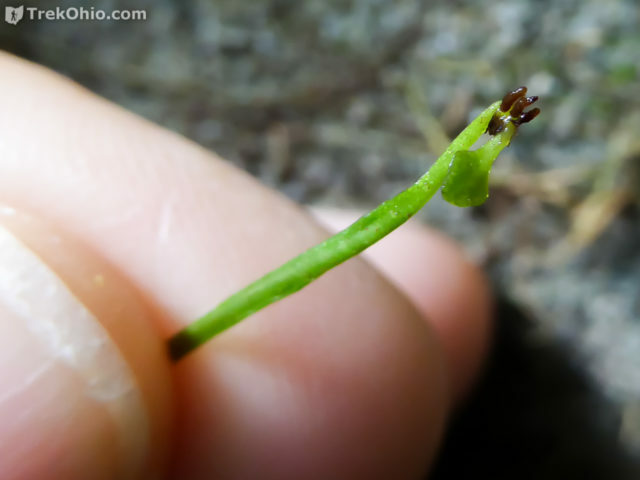 The walking fern is sometimes referred to as the walking spleenwort because its sori have that elongated, spleen-shape that we’ve seen in all spleenworts. The elongated sori on the underside of the walking fern frond. I wouldn’t have even recognized that this was a fern if left to my own devices. The frond is completely undivided, so it looks like a single leaf emerging from the ground. 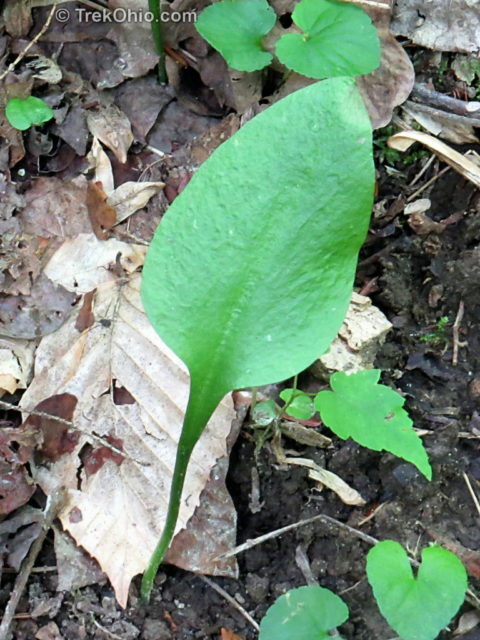 This leaf is the sterile frond of the fern known as Adder’s tongue. To reproduce the plant puts forth a distinct fertile frond next to the sterile one (not shown in the following photo). 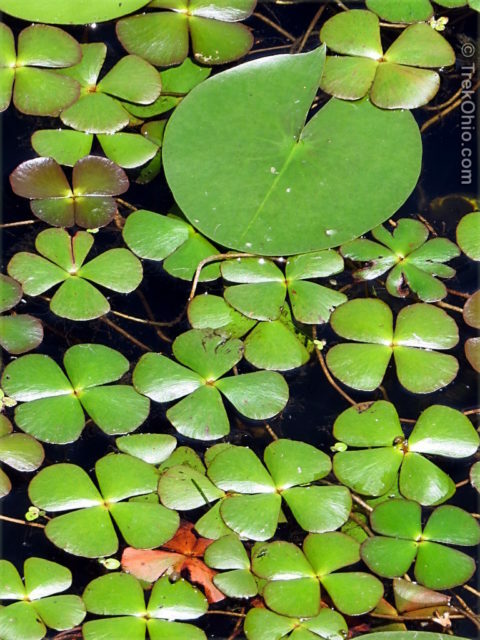 In the photo below, the fern’s fronds are floating on the water next to the lily pad. Each frond looks like a four-leaf clover. Prior to this workshop, I didn’t even know that there were aquatic ferns! 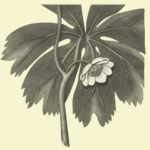 One more session of the workshop, Focus on Ferns, is being held this year at Wahkeena on July 13, 2104 at 1:00 P.M. For information on this and other programs for the amateur naturalist, check out Wahkeena’s scheduled programs. 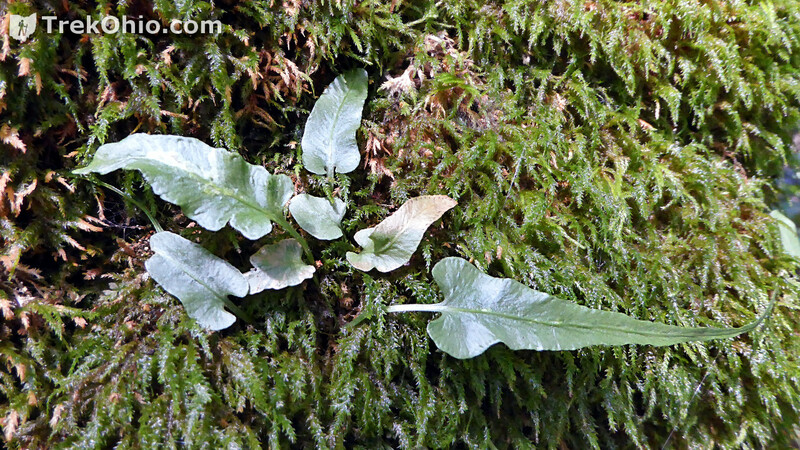 In addition, the official blog for the Wahkeena Nature Preserve has a page dedicated to ferns. 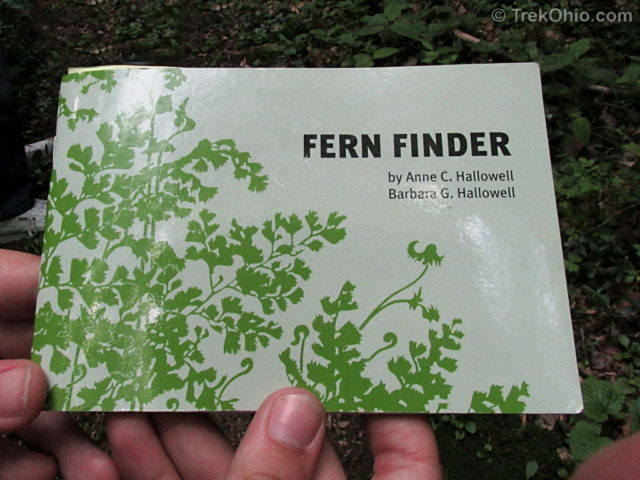 As a help identifying ferns in the field, Wahkeena’s naturalists recommended the book, Fern Finder by Hallowell & Hallowell. It used to be offered for sale in Wahkeena’s Nature Center. 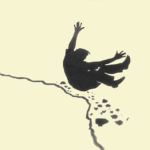 However the book is going out-of-print, so they no longer stock it. It is still available at Amazon, and we were able to obtain a copy from there. If you are interested in shopping for it at Amazon, here’s the link: Fern Finder: A Guide to Native Ferns of Central and Northeastern United States and Eastern Canada (Nature Study Guides) . 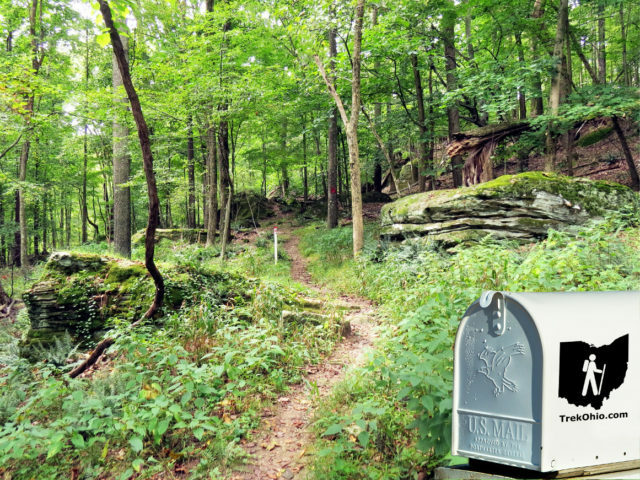 The small size of the book makes it a good one to take along while hiking. 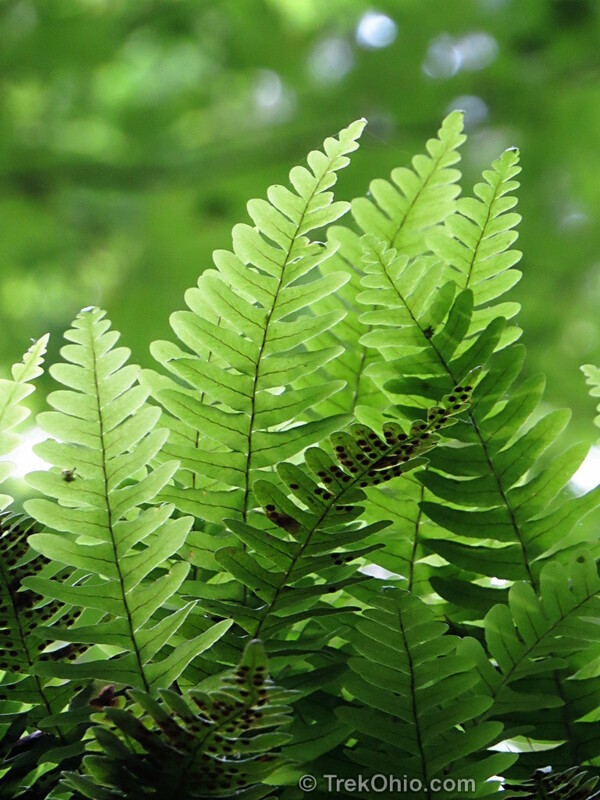 The fern species below are arranged alphabetically according to their common names. The scientific name links to a Wikipedia article where you can learn more about the species. 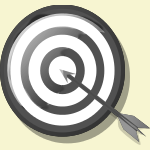 Following that is a link to a USDA map showing that specific species’ distribution in Ohio. 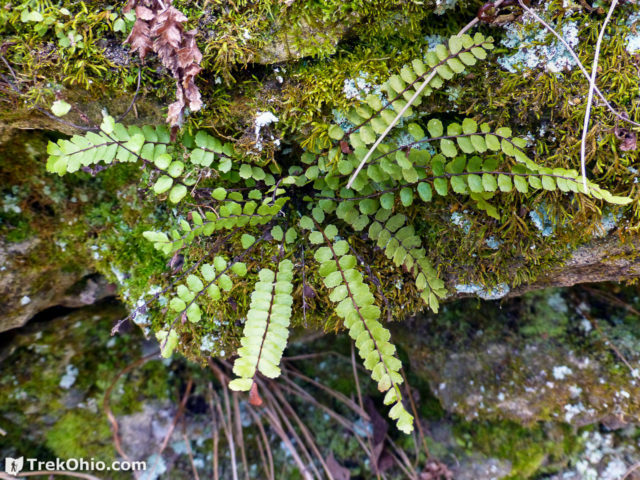 Silvery spleenwort: Deparia acrostichoides — also known as "silvery glade fern"
Share the post "Basic Fern Identification"
Previous Post Ohio Great Outdoors Quiz – Can you identify these Ohio locations? Great effort on fern ID. 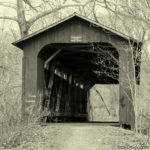 Beautiful, informative photos and comments. Unfortunately, I am looking for ferns that grow in Vegetation Zone 10, here in Pinellas County, FL. The one I’m trying to ID is similar to your Marginal Wood Fern (Dryopteris marginalis), so I will keep that data and continue my search. Thanks for this info. 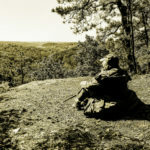 Fantastic article. Such great work and photos — thank you. I’m glad it was useful! Thanks for commenting. This was JUST AWESOME!!!!!!!!!!!!!!! Thank you so much! 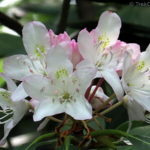 I live in central Virginia, and have been trying to identify as many of the plants growing in our 15 acres of woodland as possible. Recently my focus has been on ferns- I’ve found Christmas fern, Lady fern, Sensitive fern, Adder’s tongue, and Rattlesnake fern so far. 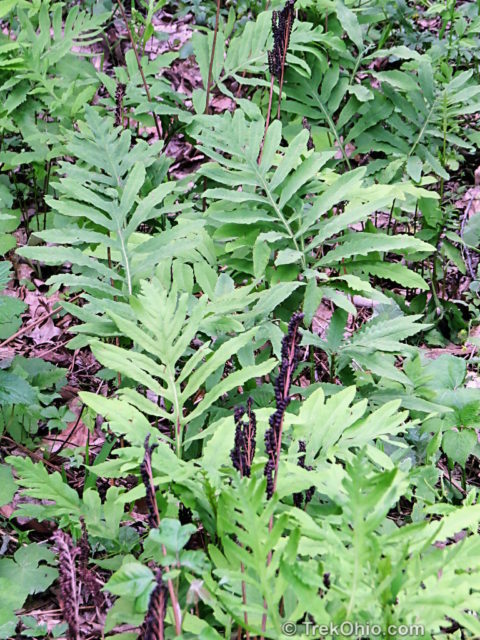 The one thing I’m puzzled by is that almost every patch of Lady fern is intermingled with something that looks pretty much identical except for the absence of reddish coloring along the stalk. Is this a trait with a fair amount of variability, or if not what else might it be? Thank you for your article, many I have come across are far to general and others read at a very scientific level assuming that I am familiar with the terms (Im not). I see this is mainly regarding ferns in the wild in a specific locale but I am desperate. I have a fern that I cannot identify for the life of me. I do not know how to identify it nor how to properly photograph for identification. 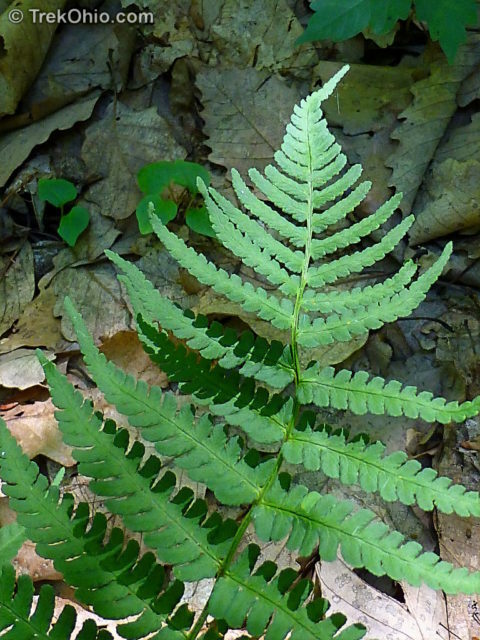 How can ferns be identified when they are not actively fertile? Any suggestions would be greatly appreciated. 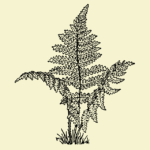 Elizabeth, have you tried checking out the link in the article to the book, Fern Finder: A Guide to Native Ferns of Central and Northeastern United States and Eastern Canada (Nature Study Guides) ? Pages 1-7 illustrate terms used in the little book, then you start on page 8 where it asks a question: Is the blade divided? “Yes” takes you to one page, and “No” to another. Then you are asked a second question, and depending on that answer, your are directed to the next stage in identifying the fern. When you have answered all the yes/no questions, you are on a page that identifies the fern. 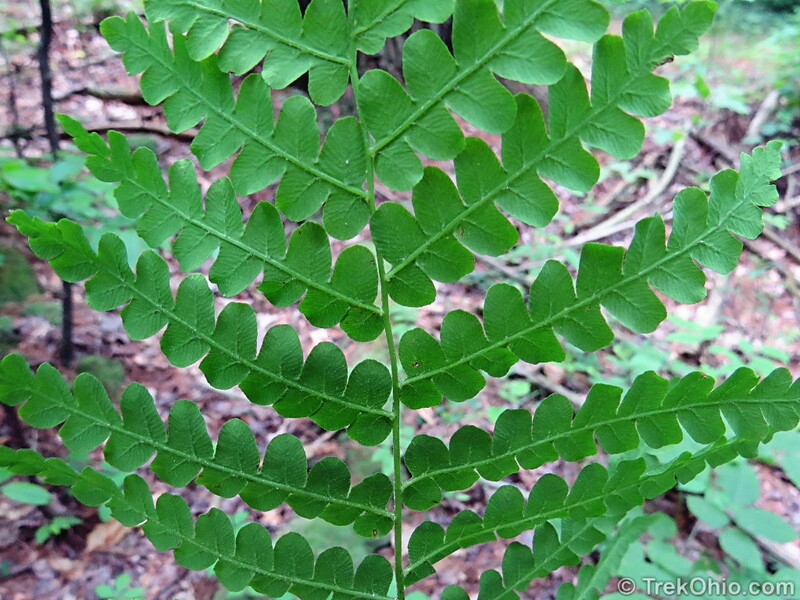 What is the shape of the frond (for instance is it like a triangle, or does it taper on both ends)? If the fern has little leaflets, are they arranged opposite one another on each side of the stem, or do they alternate in a zig-zag manner? Is the edge of each little leaflet smooth or jagged? Do the fronds kind of lean over toward the ground, or do they stand erect? Is the stem smooth, scaly, hairy, or wooly? And what color is the stem? If you are photographing the fern, you definitely want to get a shot of the stem, a frond, and underneath the frond. Another option if you are on Facebook or Flickr is to upload a photo of your fern to a specialty group, and ask for help identifying it. 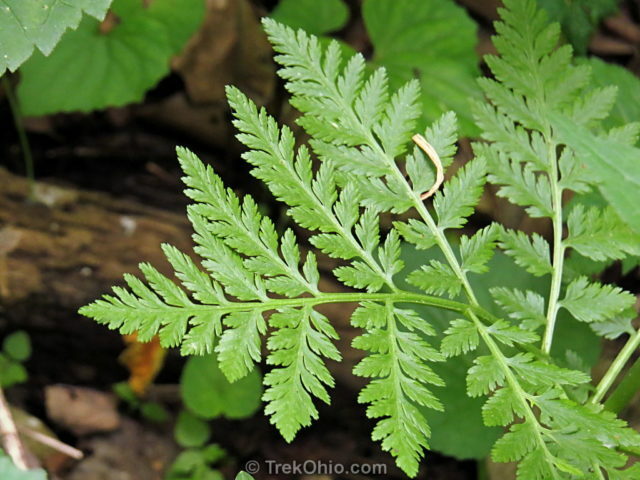 For instance on Facebook there is a group, Ohio Pteridophytes (which is a fancy name for ferns and related plants). 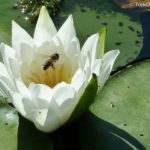 The members of this group are very helpful to people who share photos of plants that they would like to identify. 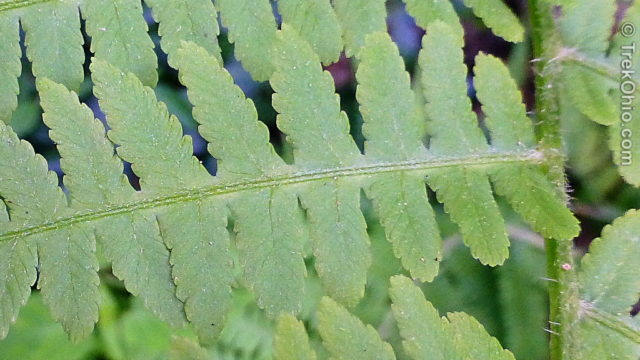 On Flickr that are a number of groups that specialize in ferns. 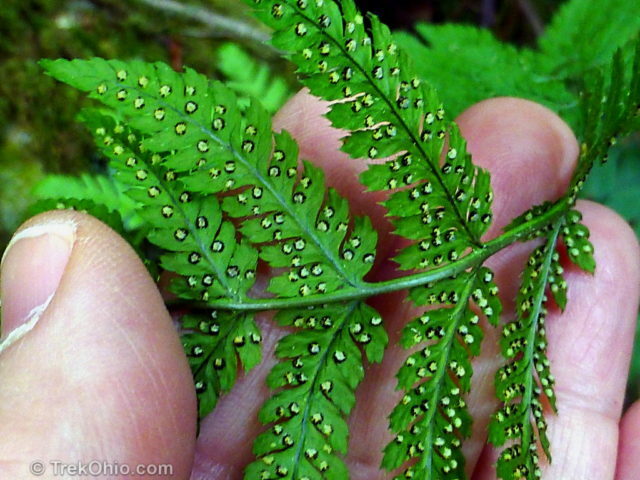 Here’s one that I just found there via a search: Just ferns. 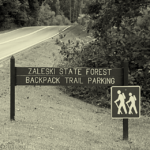 By joining a group like one of these, you can essentially crowd source your question. I love ferns, they are such cool plants! The shuttlecock fern Matteuccia struthiopteris is one of my favourites, I love the shape it creates. 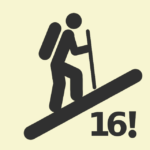 This was a really helpful post! I’ve been on guided walks during which naturalists have identified ferns and talked a bit about them, but my eyes have tended to glaze and I’ve forgotten everything nearly immediately! This information was laid out clearly, and I know I’ll refer to it again.